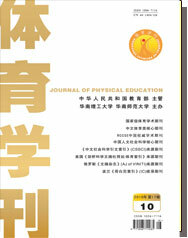 Abstract: The authors reviewed unified university physical education entrance examination mode reform in recent 20 years, and drew the following conclusions: the “physical quality” mode deviated from the original intention of univer-sity entrance examination reform, showed poor social benefits, therefore, needed to be changed urgently. Compara-tively speaking; the “physical quality + non specialized basic sports skills + specialized” mode is optimal, but has such problems as incomprehensive physical quality examinations and low test working efficiency; the “X+1+1” mode is the reforming of the “physical quality + non specialized basic sports skills + specialized” mode, its biggest advantages are that its examination contents are comprehensive, that it can guide examinee comprehensive training, and that it is more conducive to the selection and cultivation of university physical education and social physical education professionals; moreover, its design conception meets the value orientation of the new round of university entrance examination re-form, also meets middle school physical education reform reality, is more conduce to social equity. The impact evalua-tion results indicate that the economic benefits and social benefits of the “X+1+1” mode are all better than those of the “physical quality + non specialized basic sports skills + specialized” mode, can be used as an alternative mode when selecting a unified physical education examination mode in the future.